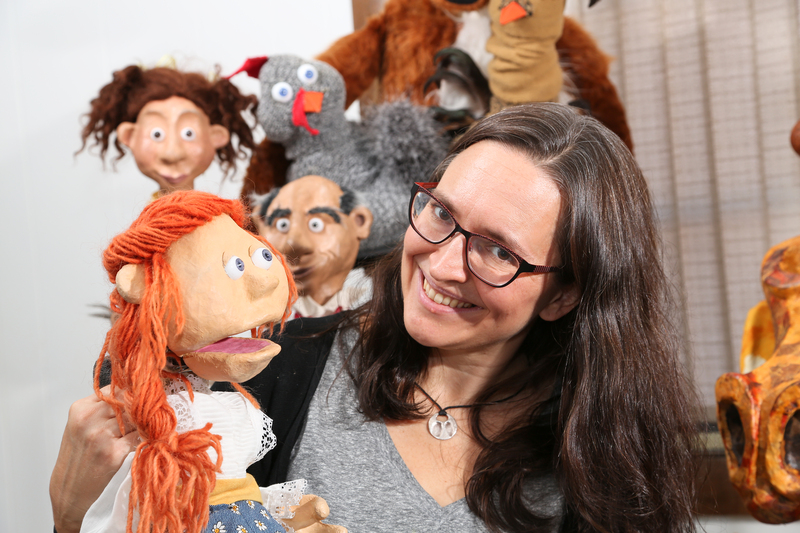 Puppeteering allows Heidi to integrate her fascination with stories, goofy voices, creativity, and writing with her love for art. She began building puppets in elementary school to fulfill visual aid requirements for book reports. Anne Frank and the entire cast of characters from Lloyd Alexander’s “The Book of Three” came to life that year. These first puppets were created using simple materials that she found around her house. Now Heidi writes, builds, and directs shows that tour throughout the country. She is also an active puppeteer/performing artists and leads workshops on puppet building and puppetry skills for children, adult hobbyists, and professional puppeteers. Her passion for combining science and puppetry has led her to becoming a advocate for arts integration. Heidi has become well-known for her puppet voices, her innovative puppet mechanisms, and original designs. She loves coming up with ideas for new shows and working with a variety of media (especially hand-made papers, wool for wet-felting, raw silk, and slinkies). In 2014, Heidi founded Puppets Off Broad Street in an effort to support more local puppetry performances in the Richmond region. She is also the chief instigator for The Fettig Project and the Naked Puppet Exhibit, a hands-on puppet exhibit that explores the functionality of puppet mechanisms. Heidi can be found in her basement studio, BUILD RVA (a makerspace in Richmond, Virginia), fiber festivals, drinking pu-ehr tea, in bookstores, at a library, and anywhere that puppets might be hanging out.